This will not be a wordy post. I don’t have anything deep or philosophical to share today. I just want to share a simple, seasonal pleasure that I find so lovely and peaceful. 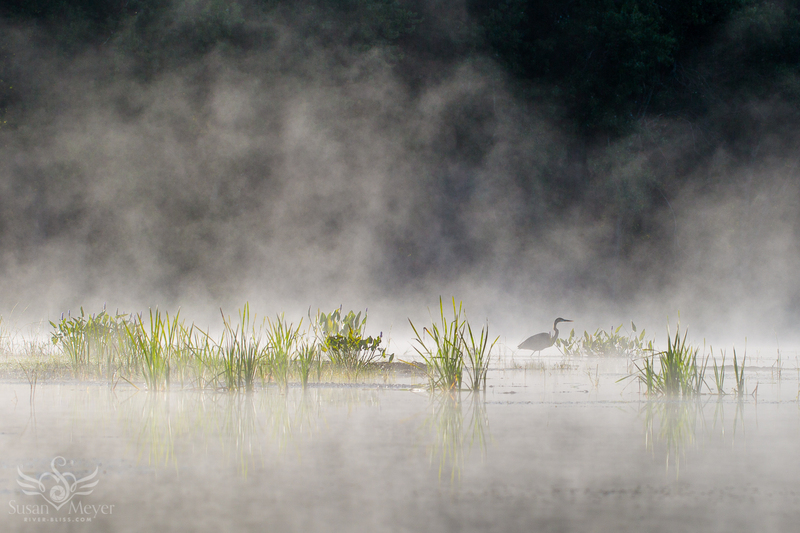 This time of year, mornings tend to be quite dramatic on the river, often featuring mist. The calm river becomes a dark, sprawling stage on which the steam fog performs a spirited ballet. I sit on my dock for a front row view and take in the graceful movement. It reminds me of the countless New York City Ballet performances I’ve seen at the Saratoga Performing Arts Center throughout my life. It’s that graceful and unified. The musical accompaniment features the sprawling, seasonal ritardando of the last few crickets and a variety of birdsong solos. It’s as if I can make out individual mist dancers and watch as they break away from the mass and twirl on their own or in small circles with other misty dancers, as part of a unified choreography and rhythm. One dance with different parts. Another dancer breaks away for a vigorous pirouette, like a tiny whirlwind, before rejoining the rest. When sunbeams shine through spaces between the leaves of taller trees, they look like spotlights shining on certain groups of mist dancers twirling in circles. Sometimes other music arises in my mind when I observe the dancing mist, such as the romantic waltzes of Johann Strauss. But I suspect that if I were to become even more still and free my listening from any filters or memories, I’d hear the misty river’s authentic music, as has happened a few times in the past. At some point, I can’t resist anymore. I get into my kayak and glide across the dark, reflective stage decorated with clusters of lily pads and aquatic grasses, as the dancers continue to move, lift, and twirl all around me. It is sheer delight and is always best when I am facing the sun with the mist in the foreground. One morning, already enraptured by the mist dancing all around me, I paddled under the bridge and noticed a great blue heron standing like a statue amidst all the activity, a striking counterpoint of stillness. Fortunately, I had the foresight to bring my camera that morning. And then there was another recent morning when I was all alone on the misty river except for a solitary goose that was moving gently in the direction of the sun. I don’t often see a lone goose on the river, as geese tend to stick together. As I “read” this image with my heart, a number of metaphors came through. 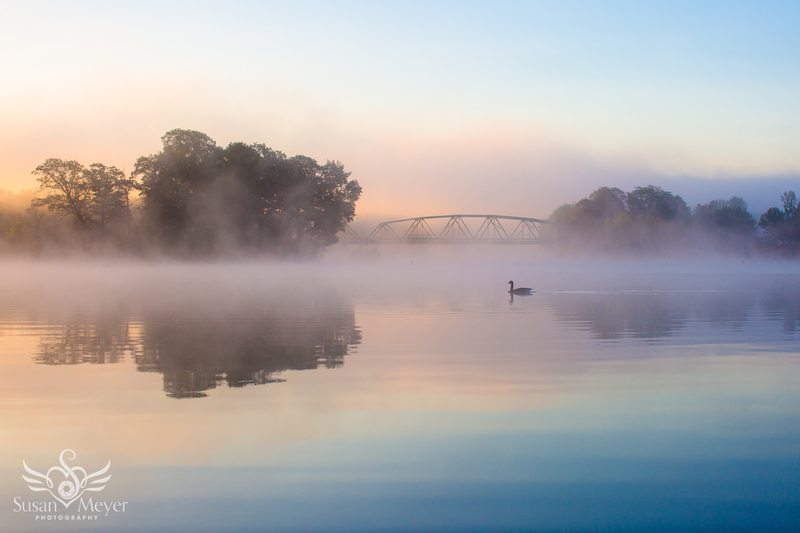 Misty, autumn mornings on the river are a special gift. Engaging with the cool morning air, the sunrise colors, the stillness of the water, and the dancing mist is such a peaceful way to begin the day in harmony with my environment and my greater Self. I feel so blessed to live here and so grateful for this time of year.